Flange gaskets are used to seal flared pipes and pipe fittings against leakage and provide vibration dampening where the pipes are joined. Flange gaskets are provided with a pressure sensitive adhesive that bonds quickly with manual pressure. Simply peel from the liner and apply for excellent sealing. Custom flange gaskets are provided kiss-cut in rolls on an easy-to-peel release liner. Flange gaskets are typically made from double coated black Polyethylene foam but they can be cut from any of our foam or sponge materials by request. 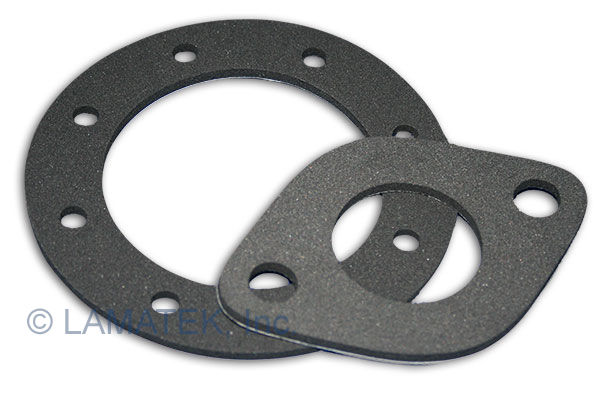 LAMATEK is an industry leader in customization and die-cut gaskets. We can customize the outer and inner diameter to fit any pipe system based on your specification. Contact us today for a quote on flange gaskets or choose from our existing library of gasket dies.